ComScore today released its latest quarterly figures on the state of the mobile market in the U.S. based on active users, and while the exact numbers are different, the basic picture is the same as the one that Strategy Analytics painted earlier in the week around smartphone sales: Apple’s iOS continues to see the strongest gains and Android has remained in the lead but with its lead reduced somewhat. There are now 234 million U.S. residents using mobile devices, with smartphone usage up 4% to 110 million — giving the country a smartphone penetration of 47%. ComScore’s survey, based 30,000 U.S. consumers, also found that the number of subscribers using Samsung and LG devices, both smart and feature phone devices, declined, as did the number on Motorola handsets. Apple and HTC, meanwhile, both went up. Samsung in the last quarter saw some of its strongest sales yet worldwide, so why did usage of Samsung decline last quarter in the U.S.? I think part of the story here has to do with feature phones continuing to be replaced by smartphones: the table above takes both into account, and Samsung (down to 25.6%), LG (18.8%) and Motorola (11.7%) all sell a mix of feature and smartphone devices. 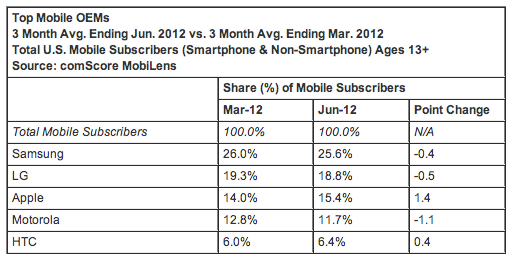 Apple and HTC, meanwhile, which grown their marketshares to 15.4% and 6.4%, are smartphone-only. ComScore does not break out how those handset makers are doing in the smartphone-only category but it does outline how smartphone platforms have been performing. Here Google’s Android has continued to remain in the lead, with 51.6% of the market, and it’s even grown — although by only 0.6 percentage points. Apple remains in second position with 32.4% share, but even without a new device on the market, it’s actually grown its share the most of any other platform — meaning that for one reason or another consumers continue to grow their engagement on the iOS platform. 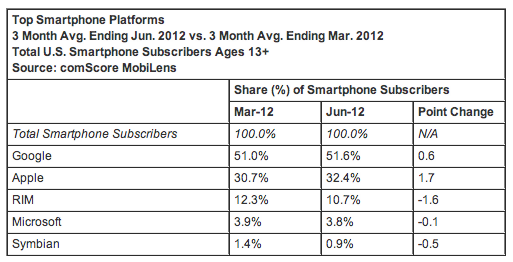 The remaining three smartphone platforms — RIM, Microsoft and Symbian — all saw declining usage. Putting these figures together with those from Strategy Analytics (it pointed out that Android accounted for less sales last quarter than a year ago, while Apple saw a 10 percentage point spike in sales), we can infer that Android’s slow growth (and maybe even some decline) might continue into the quarter ahead, unless a blockbuster Android device or two hits the market (the Galaxy S3 could be a contender there), or something else happens to boost Android smartphone usage. 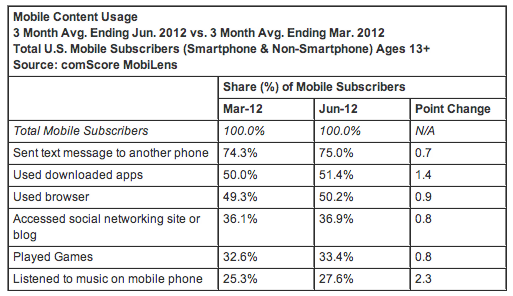 As usual, comScore has also delved a little into what it is that people are actually doing on their devices, too. Interestingly, text messaging has had a slight uptick in its usage over last year — showing that some legacy services have a lot of staying power; a full 75% of all mobile consumers sent SMS messages last quarter. Also the gap between app usage and mobile web usage is growing ever so slightly larger: 51.4% of consumers used an app, while 50.2% used a browser. Both grew, but apps usage is growing faster. Social networking on mobile devices also continues to rise: social media sites and blogs were accessed by 36.9% of all consumers. And similarly 33.4% played a game. Music was the least popular on the list but it grew the best: 27.6% of all users listened to music on their phones, a rise of 2.3 percentage points.